For those of you who would rather be beneath the surface, scouting the ocean than frolicking on the beach in the sun on your Bahamas vacation, then you’ve come to the right place. 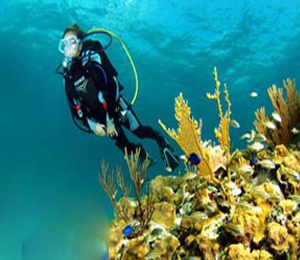 Scuba Dive Bahamas takes pride in the professionalism, safety, and fun in the tours for our visitors, and want to give everyone a wonderful experience to go home with. No matter the type of vacation you are having, or experience level you are at, Scuba Dive Bahamas has something for everyone. 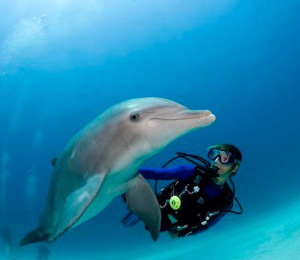 Have you ever daydreamed about what it might be like to scuba dive with dolphins surrounding you? With the UNEXSO Dive with the Dolphins, it is now possible to touch, swim, and play with these majestic creatures in their natural habitat. You’ll be amazed by how intelligent these mammals are, and how gentle they can be with us humans. The Stuart Cove Two Tank Morning Dive is the perfect way to start the day, with highly trained professional divers who make every trip unforgettable. 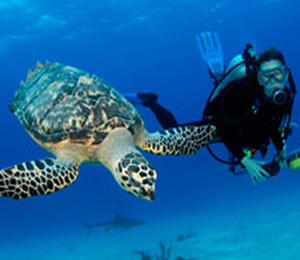 If you want to set a whole day out of your vacation for just diving, than the Stuart Cove All Day Dive is perfect for you, as you’ll explore the coral reef, a shipwreck, and interact with stunning marine animals such as sea turtles, at four different dive sites. 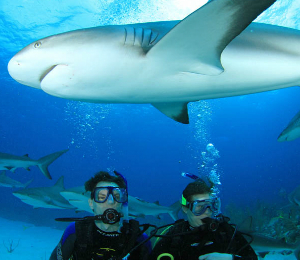 If you’re the thrill seeker type, looking for your next adrenaline jump, then the perfect dive for you is the Stuart Cove Shark Adventure Dive. Get up close and personal with these predators of the sea, and watch as a professional feed the cluster of sharks. This isn’t a tour for everyone, but it is very educational and helps the public understand these misunderstood creatures. One of our most highly requested dive sites, the Lost Blue Hole is a natural underwater hole that is a total of 200 feet deep and 100 feet across. 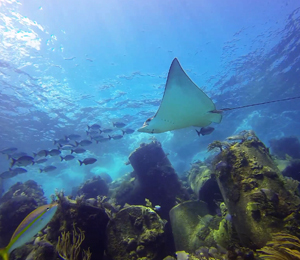 Dive up to 80 feet in the hole where you will be surrounded by some of the most unique Bahamas marine residents. 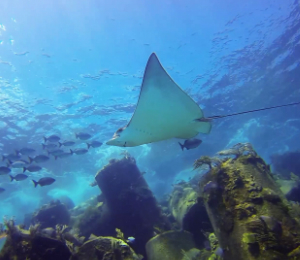 Our One Tank Afternoon Dives give you the most time in a single location off the coast of the Bahamas. Explore some of the most fascinating underwater worlds featuring all kinds of coral formations, all kinds of colorful tropical reef fish, and many other marine animals and wildlife. 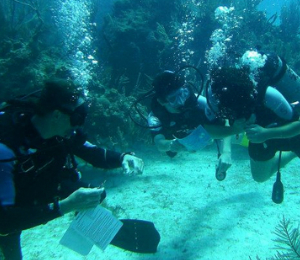 Complete your full PADI Open Water certification course right in the beautiful islands of the Bahamas! This full course includes the classroom session, the pool instruction, and four instructor-guided check-out dives. Swim down to underwater sea walls, dazzling coral reef gardens, mysterious deep blue gorges, and wreck environments teeming with wildlife. Just off the coast of Nassau, you and your friends will be able to step into a world like no other. 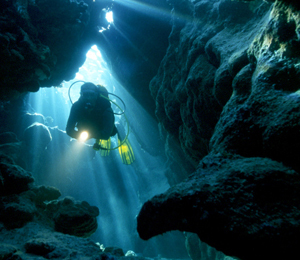 These dives bring you into an exciting setting that you are sure to never forget. Looking to go on more than just a couple dives and also save some money? 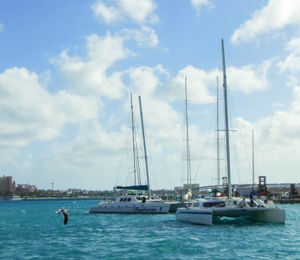 Then check out our Nassau Multi Dive packages! These dive packages allow you to pick and choose from our various dives to create the perfect itinerary for your Nassau scuba diving during your Bahamas vacation! Complete the classroom session of your Open Water Certification from the comfort of your own home with PADI's E-Learning Course, and then join us for the PADI E-Learning Referral Course! Our expert dive instructors will give you a pool instruction course followed by four check-out dives at Nassau reefs and wrecks! 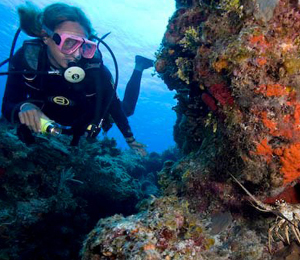 Finish the last part of your PADI Open Water Certification in the beautiful and amazing dive sites of Nassau Bahamas! This Open Water Referral course includes your four check-out dives, lead by our talented and expert team of PADI certified Bahamas dive instructors. 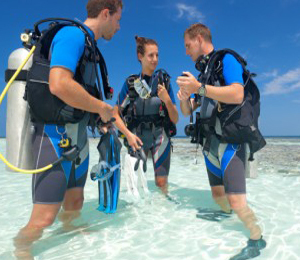 The Scuba Diver Course is meant for dive students who are intersted in completing their full Open Water Certification but might not have enough time do complete the full course. 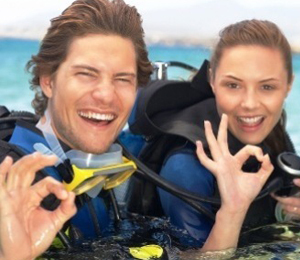 The Scuba Diver Course teaches you many of the basics of scuba diving and even includes two dives, and it all counts towards your full certification. 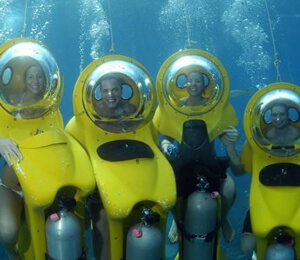 Part scuba diving and part snorkeling, the Snuba Adventure does not require any special certification and allows you to explore up to 20 feet deep beneath the surface of the water! 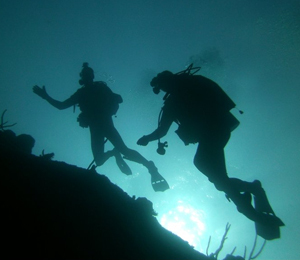 One of our most unique dives, the Ocean Wall and Reef Dive only runs once a week and allows you to explore the unique world found at the edge of a massive underwater cliff. 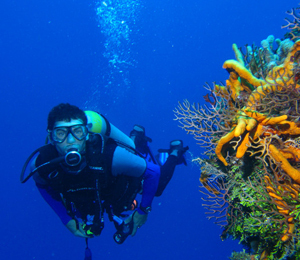 These dives are made for those divers who simply cannot get enough of diving. This is the only trip that allows you to dive all day. You will get the best of both of the morning and the afternoon dive. Explore an underwater sea wall, the coral reef, a shipwreck, and probably all three! 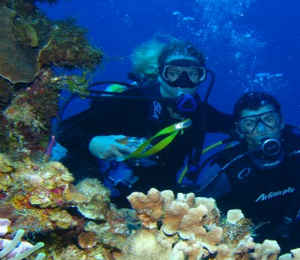 If you are passionate about diving, this is the trip for you! This course is for anyone who wants to get certified as a SCUBA diver, allowing them to go on deep dives throughout the world. 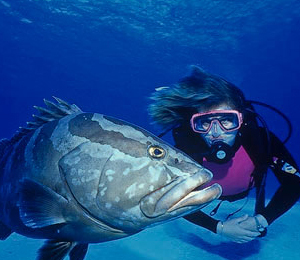 In just a matter of days, you will know how to scuba dive safely and can go on dives by yourself. 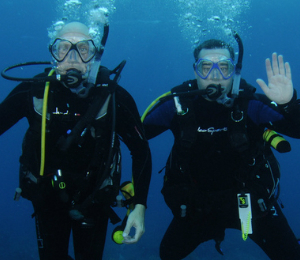 The only way you can actually go diving in the waters of the Bahamas without being certified! 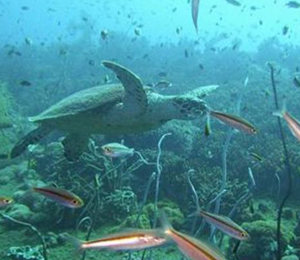 This is the best way to explore the magnificent underwater world that is found in the depths of the Caribbean Sea. 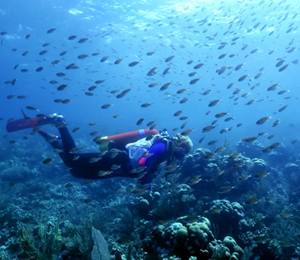 In a matter of hours you will be swimming among one of the most diverse and plentiful coral reef systems in the world. The best way to experience multiple days of diving adventures! Our multi day dive packages are made for Bahamas visitors who cannot get enough of the experience of diving in the coral reef system or our Caribbean Sea shipwrecks. Come out to the Bahamas to finish your certification dives. 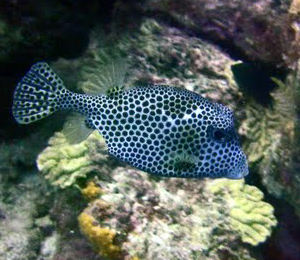 The Bahamas is an ideal destination in which to go on your first dives. 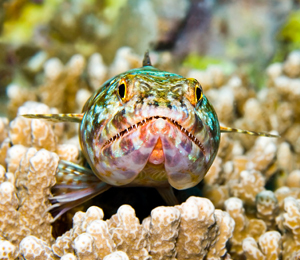 The underwater reef ecosystems of the Bahamas are teeming with coral, fish, sea plants, and other marine animals. If you are the type to look for unforgettable and exhilarating adventures, then this is the trip for you. Our Shark Adventure Dives are the ideal diving trips for people who want to feel their heart pound and their blood pump. 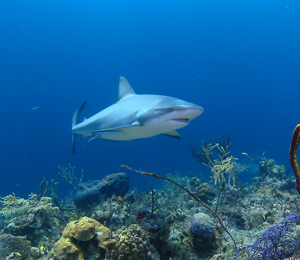 These dives will introduce you to the world of the Caribbean Reef Sharks meant to create the experience of a lifetime with an up close and personal view of these amazing creatures of the sea. Just a short boat ride off the coast of Nassau you will find some of the most fascinating and incomparable underwater ecosystems around. 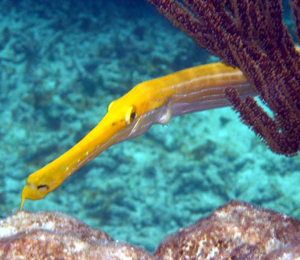 Our Two Tank Afternoon Dive takes you to two excellent diving locations in the Caribbean Sea. Explore one of our fascinating underwater walls, our coral reef gardens, or one of our famous shipwrecks. The best way to explore all that Bahamas diving has to offer, our Two Tank Morning Dive goes on two dives: first to an underwater seawall and then to either a coral reef or one of the many shipwrecks surrounding the islands of the Bahamas. Each trip is especially catered and designed to meet the needs and interests of our guests, as well as the weather conditions for that specific day. 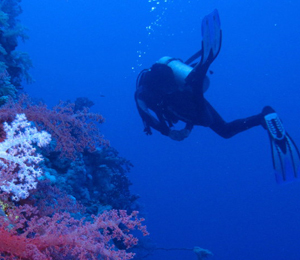 Explore the underwater world of the coral reef gardens in this most unique fashion. Our SUB Adventures allow you to use a high-tech underwater device to go on your exploration. 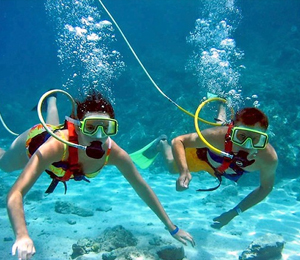 You will be able to breathe normally underwater without the use of a mask or tube. There is also no need for previous diving or snorkeling experience. The Grand Bahama Island (Freeport) One Tank Afternoon Dive is short dive trip at a shallow reef. The warm crystal clear waters of Grand Bahamas are full of shallow reefs to exploreand we are eager to share these beautiful underwater worlds with our guests! If you are looking to explore the wondrous world of the coral reef gardens just off the coast of Freeport, try our Two Tank Reef and Wreck morning dive. 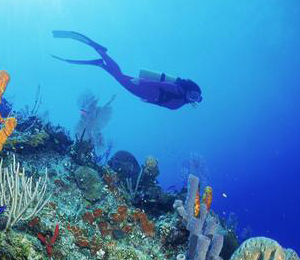 This dive takes you to a location on the coral reef that is teeming with marine life as well as one of the shipwrecks off the coast of Freeport.